Wildtree Herbs caught my attention immediately! We could all use assistance when it comes to cooking. Their unique and varied product line was the perfect fit for my program. Funny how I found out about it. An independent rep posted a flyer (in a pizza place no less). The flyer had a picture of a pizza (yum) with their tagline "Simple. Healthy. Natural.” tagline. With pizza being one of my favorite foods, I had to try it....and became hooked...as many do. It was founded by a single mom with kids that had special dietary needs. So not only was their health a priority...but also time and money! 2. QUICK & EASY food preparation. Also you won’t find any partially hydrogenated oils or high fructose corn sryup. 90% is gluten free! Additionally, all their bread mixes use unbleached flour. 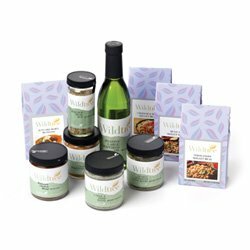 The Wildtree line isn't "pre-packaged meals" nor does it include the proteins (meat and fish), dairy and eggs. Items are used in the preparation of your meals ...which can usually be created in five to 15 minutes. Talk about quick and easy. That Delivers To Your Door! So if you're looking for a Quick & Easy cooking option, Eating Healthy or both, Wildtree is a great option. Simple, Healthy Cooking Solutions start with having a properly stocked pantry. Not only does your meal preparation become easier, but you're just making a shift in your spending by switching stores...so no extra to squeeze out of your budget! Are you ready to get started? Learn More About The Wildtree Way!